Today marks the 11th anniversary of my arrival in the UK. Anniversary number eleven means gifts of steel (apparently) – not a flashy or expensive token of my fortitude and faith yet somehow appropriate. Let’s face it – steely determination has been an essential prerequisite in building my new life here. Today I also became a British citizen. Well actually, me and about 30 other people from a cross-section of 21 nations: from Africa to Asia Pacific, from the continent to the sub-continent and the Russian Federation (where exactly does this belong now?). A mere slice of Barnet‘s multiculturalism compressed into the Council Chambers at Hendon Town Hall. 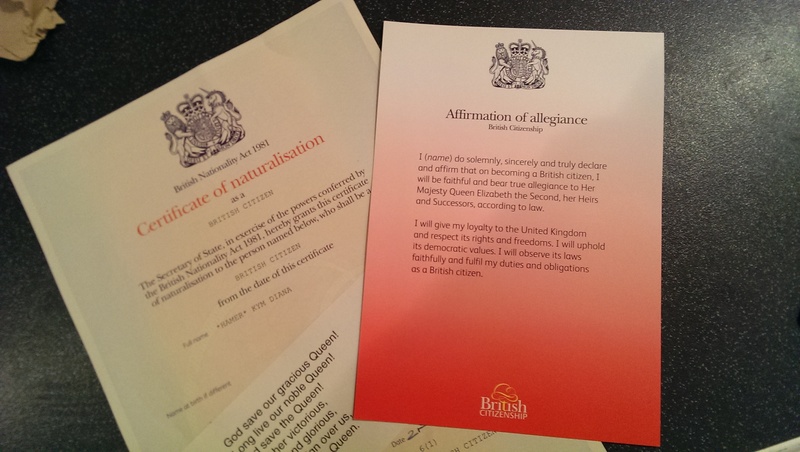 So sometime between 10.30 and 11.10am this morning, I made my ‘solemn, sincere and true’ declaration and pledged my allegiance to Queen and country. The Deputy Lord Mayor of Barnet shook my hand and handed me my Certificate of Naturalisation. I warbled my first God Save The Queen as a Brit. And it was done. I’ve also retained my Australian citizenship so now, rather than being a citizen of one and a resident of the other, I am a fully fledged ‘member’ of two tribes – the two nations that rule my heart. And today, my divided heart felt the significance of this morning’s ceremony. But it wasn’t the passionate advocacy of the registrar or the deputy mayor to accept our new British-ness with pride or their heartfelt thanks for choosing a home here that moved me. Rather it was their reference to the ceremony as a rite of passage. It felt like a small stone marker had been placed into my expat life: in a moment I was taken back to the 21st of January in 2004 when me, my two suitcases and a whole lot of steely determination arrived at Heathrow Airport to stake our claim. Eleven years on, I stood in a room full of strangers and with a pledge, a song and a piece of paper, stepped over the threshold and into a new chapter as a British citizen. This entry was posted in Expat moments and tagged citizenship, Life in the UK, milestones by Kym Hamer. Bookmark the permalink. Welcome to the club! Dual citizenship rocks. You can hedge bets on sporting matches, refer to both as ‘home’ and choose where you want to permanently live without fear of not being let back in. Congratulation! It is a big step! But I can understand your double side feelings too. It is strange.